Student hall 5 lie outside the view, click here to scroll down. Since its founding in 1991 with 77 students, the up-and-coming locations in Wernigerode and Halberstadt have developed rapidly. 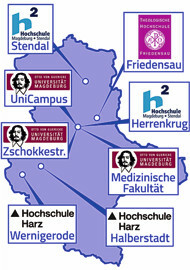 Innovative, practice-oriented degree programs in the fields of automation and computer science, business administration and economics nowadays attract to Harz more than 3,300 aspiring academics from all provinces. The campus Wernigerode is nestled in a beautiful park. The town of Wernigerode, located on the north side of the Harz, has gained considerable supraregional importance over the last 20 years. Half-timbered buildings and cosy streets typical of the Harz add a distinct touch to the image of the colorful town in the Harz region, which is now a popular excursion and vacationing destination. The castle erected in the 12th century is one of the most distinctive local attractions visible from afar.